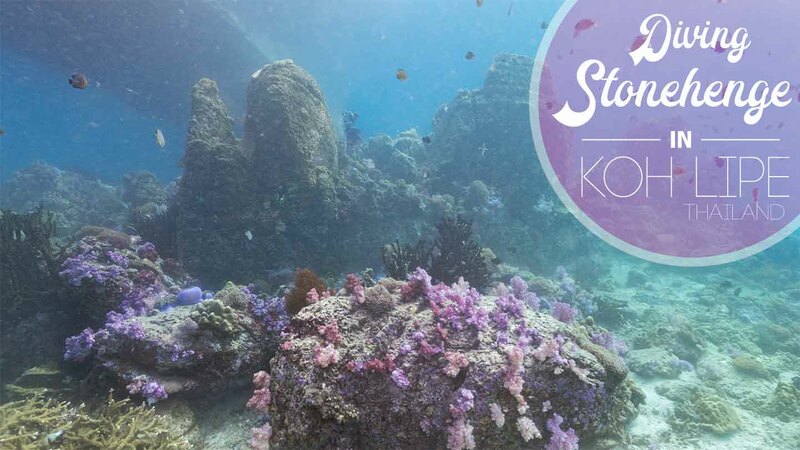 Off the southern end of Koh Talang, Thailand lies the dive site named Stonehenge of Koh Lipe. The site is just a short longtail or speedboat ride away from Sunrise Beach is one of the best dive sites around Koh Lipe. The entire perimeter of Koh Talang is frequently dove by many of the dive shops on Koh Lipe. However, Stonehenge is the most popular due to its high density of nice soft corals and unique topography. The stones of Stonehenge Thailand are what really make this dive site what it is. Where does the dive site get its name Stonehenge? Located 6,196.1 miles (9971.7 km) away from the peculiarly placed stones in England, Koh Lipe’s Stonehenge in Thailand does bear some resemblance to the ancient monument. Below the surface, hundreds of granite pinnacles protrude out of the seabed looking a bit like the ancient Stonehenge. There are several spots along the site where multiple stones are clustered together adding to the feeling and appeal. Aside from the massive stones plunked down into the sand at Stonehenge the other major draw to the dive site is the beautiful soft corals. Colorful and bountiful, soft corals are everywhere on this dive site. Many of the massive stones that make up the “Stonehenge” are also covered in nice purple and white soft corals. 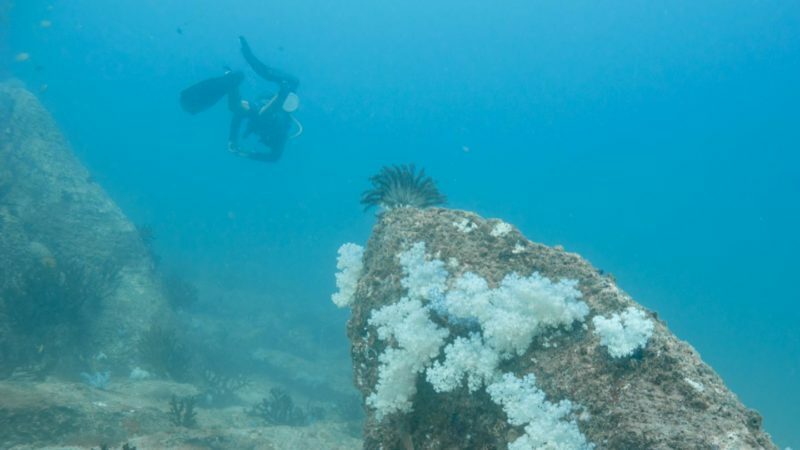 The deeper you go you’ll see more white colored soft corals compared to the purple corals you’ll see growing in shallower depths at Stonehenge. The blend between the hard granite stones and the soft corals is what really made the dive special for me. Some stones were covered more than others, but it was a beautiful jeux de position 50ft below the surface. If you’re lucky you’ll run into the “resident” massive school of yellowtail snapper that swirl their way around Koh Lipe’s Stonehenge dive site. On our last trip to Koh Lipe, we ran into them which made the dive that much better. There could have easily been 10,000+ in this particular school we wandered into. Definitely, one of the larger schools I have encountered in all of my diving. They were a bit skittish but some groups didn’t mind me joining the school for a minute. I say “resident” with quotation marks because I was told by multiple dive masters that “they are always there”. However, I can’t say for sure and if what every dive master said was true, I would have seen a lot more stuff in my diving career. So, hopefully, they are there when you dive Stonehenge Thailand, but if not it’s still a very nice dive while in Koh Lipe. I have also seen them on several other youtube videos on Stonehenge Koh Lipe too. Besides the massive rocks, soft corals, and snappers there are lots of other details to take in while diving Stonehenge in Koh Lipe Thailand. We ran into at least three moray eels, a few inquisitive clownfish, and plenty of typical SE Asian tropical reef fish. Other fish that are frequently seen according to local Koh Lipe dive shops: frogfish, pipefish, nudibranchs, lionfish, batfish, seahorses, barracudas, and trevallies. If your dive master plans the dive properly you can finish your dive with a nice swim around a colorful portion of the site situated at 5 meters. We slowly worked our way around the dive site and finished at a nice plateau with plenty of life at the required 5 meters. I much prefer to have something to look at while safely ascending from a dive rather than staring at my dive computer waiting for my three minutes to be up. As of 2017, there is an additional 200 baht National Park fee for divers on top of 200 baht National Park ticket. This will be a one time fee, your name will be added to a list of divers that paid the fee so additional dives will not incur this fee. If you need a day off from diving consider taking a longtail boat over to Koh Adang for the day or even the night for some beach camping. The best view of Koh Lipe is up at the viewpoint hike. It’s only 100 baht per person ($3 USD) for the quick ten-minute ride over. For less than $45 USD a day you can rent a private longboat for the day to explore the nearby islands. If you’re on a Thailand honeymoon this is a must, find yourself a private island for the day! There are group trips that have a set island schedule but it’ll be with 6-10 other tourists and for only a few more dollars you can have the whole boat to yourself and you set the schedule. If you’re itching to get in the water don’t worry there are some great spots for snorkeling in Koh Lipe and the surrounding islands. After a few days diving in Koh Lipe consider doing some island hopping in Thailand and check out other great dive spots in Thailand. Have you gone diving in Thailand? What was your favorite Thailand dive site? Hopefully, I put Stonehenge Thailand on your diving bucket list! Just dived Stonehenge a couple days ago and it was amazing – lots of current though. Thanks for the great post! I read it before we got to Koh Lipe! Who did you go diving in Koh Lipe with? So great to hear you loved diving in Stonehenge! Let us know if you have any other Thailand travel guests or Koh Lipe. Safe travels. Stonehenge is simply amazing. I did my Open Water on Lipe in March and I have never been diving before. It was a life changing experience and I will definitely come back one day for diving and the beautiful island. It is a true gem that I actually found through your website 🙂 Thank you guys!! What a great place to get your open water dive certificate. Who did you dive with?